It's been a month now since I started this blog. 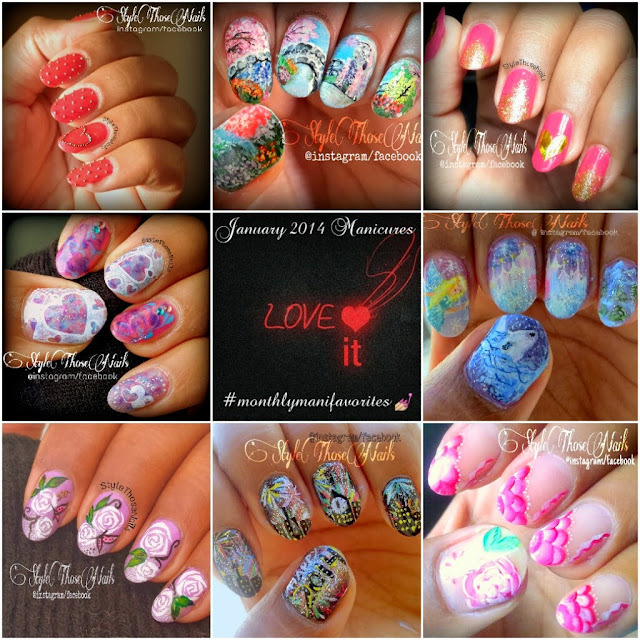 I was really not sure if I will restart my journey after loosing my old blog mydailynaildesigns as you know it really takes time and effort to write and run a blog. But thanks to all my lovely friends and Amazing nail community who supported me , I completed my one month of nailart. Here is a little collage of all nailart I did this month. You can read details of each from the Jan. Archive. Let me know which is your favourite nailart or designs. Also follow my social networks to stay in touch so you get updates on new designs as well. I love the glittered heart cut outs! Did you freehand that, or is it a stamp? If a stamp, what did you use?